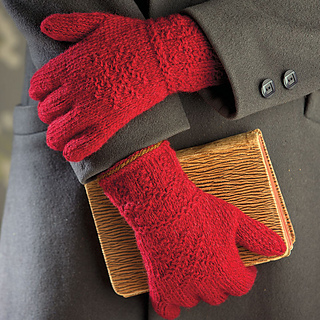 These Twined Knitted (or Two-End) Gloves are made with the Swedish technique Tvåändsstickning, which developed in Sweden around the 17th century in the Dalarna region. 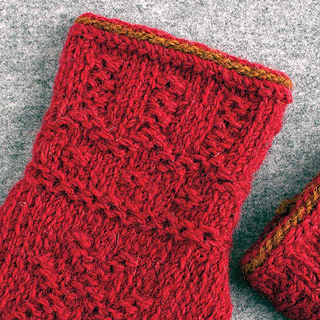 By utilizing a yarn from each end of the ball and using the yarns to work alternate stitches, a thick, warm fabric with embossed motifs can be made. The Swedish knitters used Z-plied yarns; yarns spun in an S direction, then plied together in a Z direction, so that when worked in twined knitting, the yarns would open up and soften, rather than get harder and more twisted. I recommend Black Water Abbey yarns for this project (they are Z-plied) although I have worked with conventional yarns such as Cascade 220 in twined knitting with very good results! 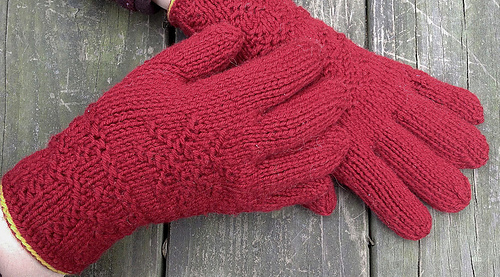 If you have never twined knitted before, never fear! All the information you need is in the pattern: a traditional twined knitted cast-on, directions for yarn management, how to twine knit, purl, and increase, as well as how to create the basic units of design. There is also a glossary, and charts of the right hand and left hand of the gloves. The traditional cast-on uses a few yards of a contrast color. This pattern is available as a kit in my Etsy shop, and includes the pattern, yarn, and a project bag. Finished Size 7.75 inches (19.7 cm) hand circumference, 10 inches (25.4 cm) long from CO to tip of middle finger; to fit a woman’s medium hand. Yarn Black Water Abbey Worsted (100% Z-plied wool yarn, worsted weight, 220 yards (201 m)/100 gram (3.5 oz) skein): 1 skein of Haw (red, MC) and 10 yards (9.1 m) of Autumn (yellow-brown, CC). Needles Set of 4 or 5 double pointed, size 6 (4 mm) or size needed to obtain gauge. Notions Markers; stitch holders or waste yarn; tapestry needle. Gauge 12 sts and 12 rnds = 2 inches (5.1 cm) in twined St st.
Notes It is common that knitting the fingers of a glove will result in a tighter gauge, owing to the smaller circumference. Watch your gauge carefully and adjust your needle size if necessary.